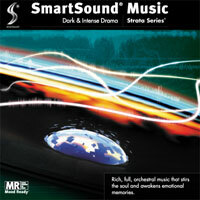 Rich, full, live-orchestral music that stirs the soul and awakens emotional memories. Great for adding intensity and depth to a variety of characters in the throes of dramatic change. These lush tracks are delivered in Smartsound's unique Multi-Layer format giving you access to the tracks' components and instruments to shape the dramatic texture precisely to your video's needs.